'I will go out of my way to track down earrings I love’ says Pandora Sykes - Sunday Times Style's fashion features editor and founder of pandorasykes.com. Hot on the heels of the best new designers bursting onto the jewellery scene, her approach to jewellery is ‘more personal than when it comes to fashion'. Delving into her collection between outfit changes, at her chic Notting Hill flat, the super-stylish Wardrobe Mistress talked to us about packing light and why she never looks to the catwalk for jewellery trends. How would you describe the jewellery you wear? I like chunky gold pieces that are ageless. I love earrings in particular. You are the queen of statement earrings. Are there any brands we should be looking out for? One of the questions I get asked the most when I do an outfit post is where I get my jewellery from. I tend to wear big earrings for events rather than for everyday. Australian designer Christie Niccolade’s makes the most amazing earrings (I have three pairs). I’ve just discovered Ranjana Khan on Avenue 32 - her colourful earrings are really cool. Other designers I am currently wearing are Sarina Suriano and Maria black. Are you inspired by the jewellery you see on the catwalk? I’m obviously really aware of what goes down the catwalk clothes wise; that’s my job, but I really don’t look to the catwalk for jewellery inspiration. I don’t look at what anyone else wears, I just know what I love. How do you view jewellery within a fashion context? Jewellery feels a lot more personal that fashion. It normally relates to people, holidays, events or special occasions. You don’t change it season by season like you might change your clothing or style. With that in mind, do you have any pieces you never take off? Growing up I didn’t wear a lot of jewellery but I did have this silver eye ball ring from Crazy Pig - Ozzy Ozborne and Alex Chung’s favourite jeweller. It’s a motorbike shop that has pictures of it’s customers all over the walls. The ring doesn’t go with anything I wear now but I love it because it catches people’s eyes wherever I go. You have a great collection of rings - tell us more about them. I don’t wear costume jewellery on my fingers anymore because I hate my fingers going green once the plating wears off. This pinky ring by Sabine Getty was a wedding present from my Dad. These two rings that make up a smiley face are by a young brand called Ruifer - I love their humour. 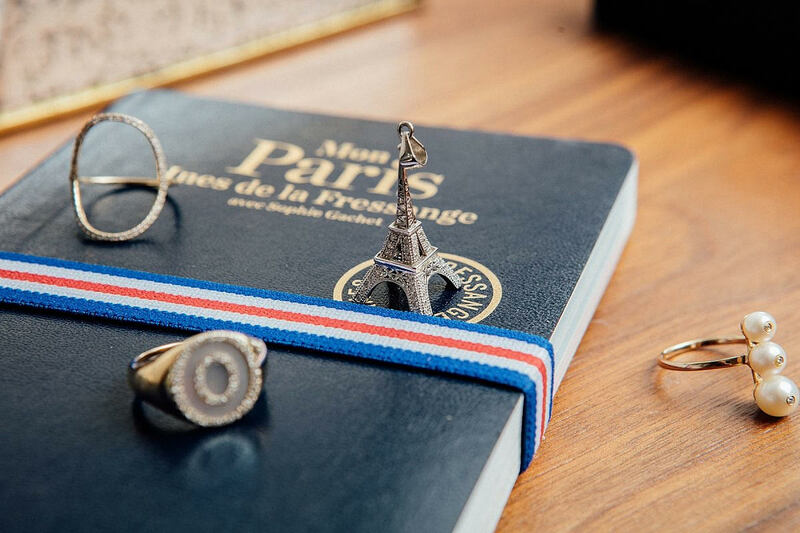 I wear a couple of gold rings by Sarah Ho that sit alongside my wedding and engagement ring. camera Rings (left to right) by Sabine Getty, Ruifer, unknown, Crazy Pig, Sarah Ho, engagement ring by Darcy Jewels and gold bangles by Georgina Boyce. And what about your engagement ring, did your husband propose with the ring? Just before we got engaged my husband’s grandmother passed away. When his family were clearing out her bedside table they found a ring that had 4 diamonds set in a row. He proposed to me with that ring and said I could re-design it. I took it to a friend of my sister who has a company called Darcy Jewels that specialises in bespoke engagement rings. It was such a cool process, we sketched some ideas together and she then created a wax model so I could try it on before we went ahead with the design. I wanted it to look old and she achieved that really well - people always asked if it was passed down. 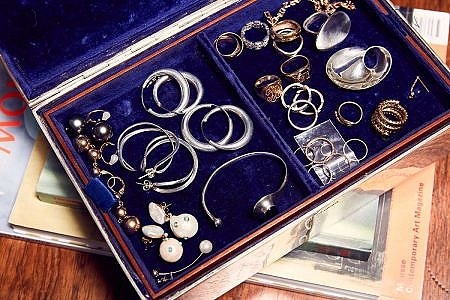 What is your earliest memory of jewellery? At Christmas I always used to think I could hear Father Christmas’ bells when he filled the stockings but then I realised it was my Mum’s gold bracelets that were always jangling. Do you have any jewellery tips? Wear stones that match your eyes - if you have green eyes wear Emeralds and wear Sapphires if they are blue. Also don’t take loads of jewellery on holiday - it gets tangled and you don’t wear it. It’s like taking too many shoes - you only ever wear one pair. I went to Croatia recently and wore a pair of gold hoops and a couple of Daniella Draper silver chains. With a tan you only need a couple of basics. Are there any brands you are championing at the moment? I am always on the look out for new designers. It’s a really exciting time to be wearing jewellery because there are lots of emerging designers making jewellery more affordable. I wear a lot of i+i jewellery because they create quality fine jewellery at a reasonable price. 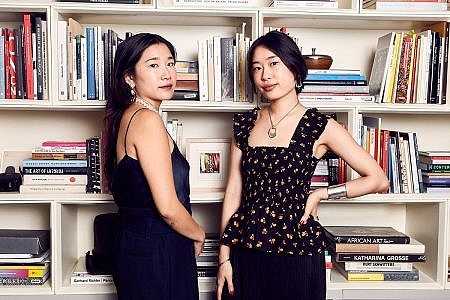 I love Sammie Jo Coxon and Anissa Kermiche who launched their debut collections this year. If money was no object, I would dress head to toe in Magdalena Frackowiak’s jewellery.